(2) Except as specified in §61.197(b) of this part, expires 24 calendar months from the month in which it was issued or renewed. (e) Ground instructor certificate. 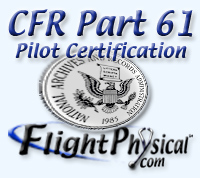 A ground instructor certificate issued under this part is issued without a specific expiration date. (f) Surrender, suspension, or revocation. Any certificate issued under this part ceases to be effective if it is surrendered, suspended, or revoked. (g) Return of certificates. The holder of any certificate issued under this part that has been suspended or revoked must return that certificate to the FAA when requested to do so by the Administrator.